By Kate Carlson Colleran and Elizabeth Veit Balderrama. Are you ready to Smash Your Precut Stash? Grab your FQs and we will help you turn it into a beautiful quilt called Wayne’s Quilt! We will show you how to combine your FQs with additional fabric. You will learn about color, value, scale and print and become confident in your ability to mix fabrics and create a beautiful quilt. 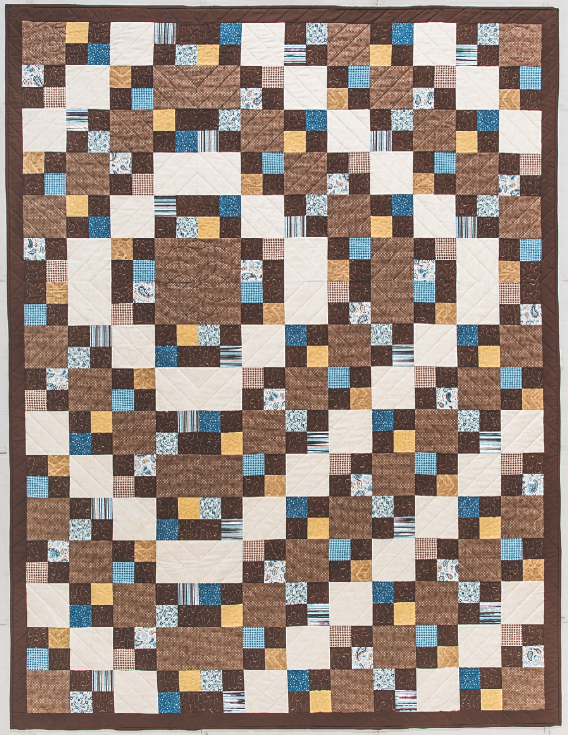 The class will cover information about strip piecing and setting options for this quilt. Each student will learn to make the 2 blocks and will have some or all of the their blocks finished and know how to put their quilt together. This class is appropriate for all skill levels. We would recommend 2-3 classes of 2-3 hours each depending on the general experience level of your students and how much color theory, fabric mixing and cutting is done in class. (* see tip below for a suggestion!) Homework would be included and then students would walk away with most of their quilt top done. The class could also be a full day class with the expectation that the students will not make all their blocks, but will make a few of each and know how to finish the quilt. *Tip: How about scheduling a short 1-hour Class 1 or “pre-class” session that can focus on color theory and picking fabrics? Students would bring in precuts from their stash (or not!) and you would give them information on color theory, how to use a color tool to help pick other fabrics- refer to pages 7-9 in our book on color and page 55 for specific information on choosing fabrics for Wayne’s Quilt. Students could wander the store to select additional precuts and the coordinating fabric for their project. This would encourage students to purchase fabric at your shop and with your help gain confidence in color selections. You can also cover other precuts or fabrics that could be used in each project. Basic Sewing supplies- such as sewing machine, rotary cutter, ruler and mat, pins, thread, etc. Flannel or batting for a design wall. Select fabric for each block- page 56. Additional Notes- If your students want to make a bigger quilt, have them follow the instructions on pages 78-81 for Big Wayne. It is a bigger version of Wayne’s Quilt with more borders but the construction techniques are the same.